After 2 weeks in the sun in Norway we now have unfortunately returned back into the routine life. But we also have some news for you as we have worked diligently at the house. The basement of the house was plastered, the entrance door was painted, the area at the basement has been revamped and many little things here and there have been refreshed. 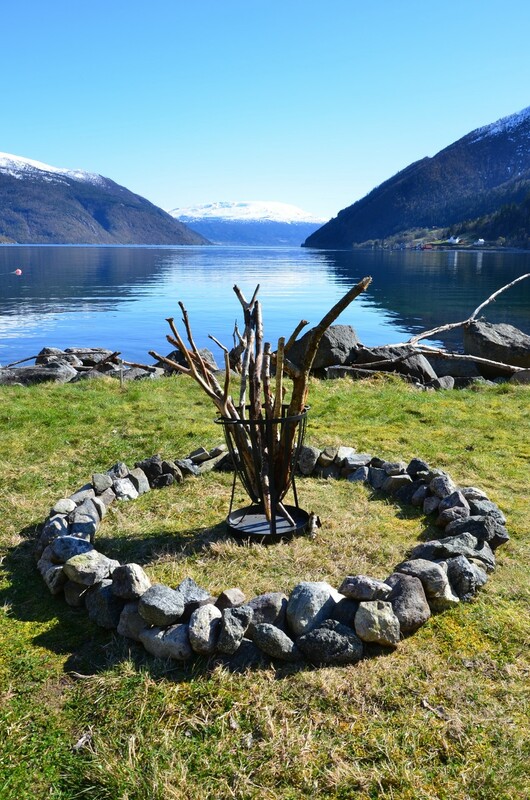 A small stream, a new seating opportunity on the fjord and a fire pit where you can sit in the evening in front of a beautiful fire and watch the setting sun (if it sets). We hope you enjoy it! We look forward to our guests and the new season, this year with many dear friends and acquaintances! We just arrived back from our Easter trip to Norway. It was great! Cross-country skiing, snowshoeing and downhill ski for 10 days with not a single cloud in the sky! So if you have never been to Norway at easter, you should try it. But, we had to do some things to the house as well and as promised, we would like to keep you up to date regarding the work on the house. We finally have a new water pump in the house. Before only the incline generated the pressure, so it was time. Now we have finally a lot of pressure on the tubes. By the way, without overestimating, the water from the tap one of the best I've ever tasted! So, do not bring water with you, save it in in your luggage. Furthermore, some painting work was done to the living room. Also new curtains and a new door in the basement connecting both parts of it. The boat is thoroughly cleaned and many small, new accessories here and there were also placed. 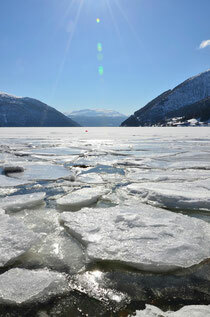 As you can see in the photo, it was a winter wonderland with masses of snow, bright sun and a frozen fjord. However, this gave us no opportunity to build a new landing stage this year. As already indicated, you will enjoy a freshly cleaned and maintained boat, smiling at you from the newly arranged rope system. A couple of rubber boots in extra large we have provided for you as well, so you dont get wet feet. 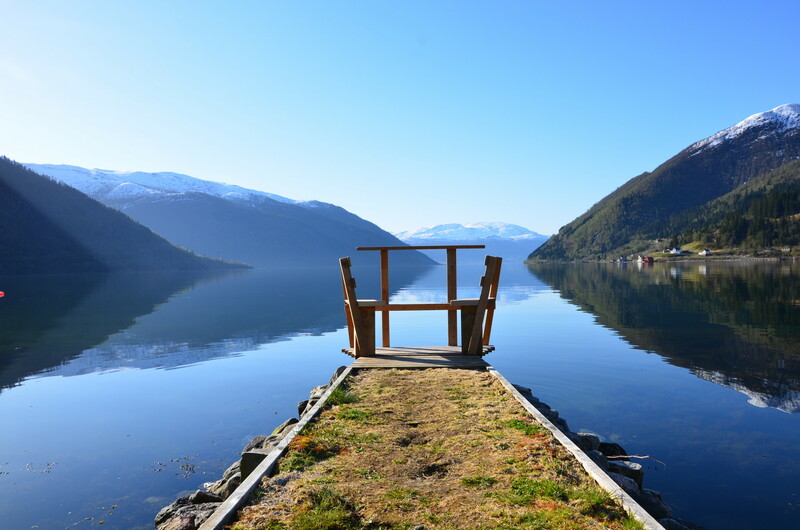 The fjord is free and crystal clear again until you arrive and nothing should prevent you from enjoying a small boat trip to buy some salmon from Inge Menes or even catch a few fine specimens yourself. The glacier is around the corner and can be reached by boat from Balestrand. The mountains are ideal for hiking and the views ... well, that is out of words, even for us again and again! We look forward to the new season and to all our guests and hope you all will have a wonderful time! The landing stage that was in front of the house has now gone. The original owner of the house had the legal right to purchase it back from us and he has taken it. We are now working on getting a new landing stage to go in the original position but in the meantime there is a perfectly good solution of bringing the boat into the beach which is also directly in front of the house. The boat will be kept on exactly the same mooring as before using a tried and trusted Norwegian rope loop system. So we would like to reassure all of our guests that the boat can be accessed and used on demand and there is no inconveniece to you. Hopefully we can also get a new landing stage ready in time for this season but at the moment we cannot fully guarantee there will be a new one. We will keep you posted about the progress and in the meantime the beach will be the point of access. Our first season is over and it all went so quickly and swimmingly well that we didn't realise it is already autumn. We had so many lovely guests and were able to let them enjoy a memorable time in Norway. 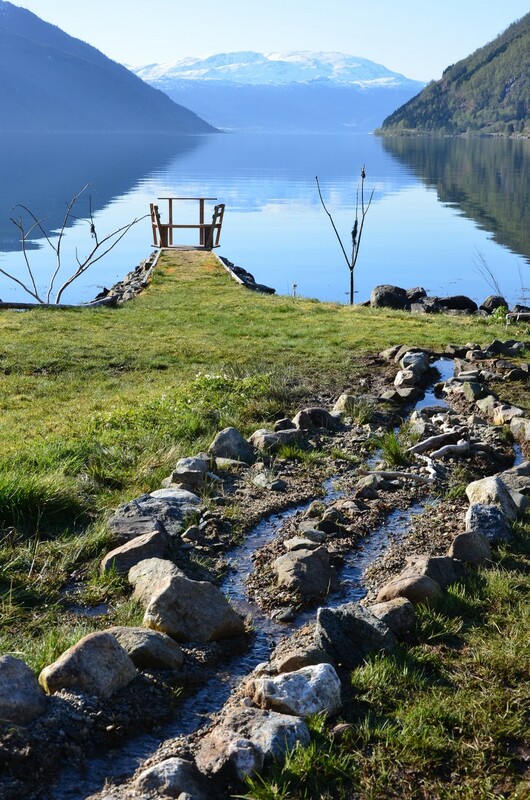 We therefore would like to thank everybody who appreciated our "Villa Sognefjord" as we hoped for. Maybe we will see some of you again someday. The first guests are already at home and have left a few comments in our guestbook.Have a look. So you can take part in their experiences as well, we have asked them to send us some pictures, have a look here: guestpictures. Finally I get time to post some more news. As you all have seen already there are new pictures of the inside of the house . We hope that you like it . I can tell you that many hard-working volunteers with a lot of sweat and blood have been working on it for you. You now have a new bathroom, new parquet, new furniture and electrical appliances and an all around, beautiful Norwegian cottage. We already look forward to our guests, which will hopefully love our little villa just the way we do. We have just bought a new boat for the house that you can use for great fishing trips next spring instead of the old one. The new furniture has also arrived and just needs to be assembled by us. After several days of waiting for the D number, opening accounts, signing contracts and constant tremors in the hope for good exchange rates, it is now accomplished. The flights are booked. 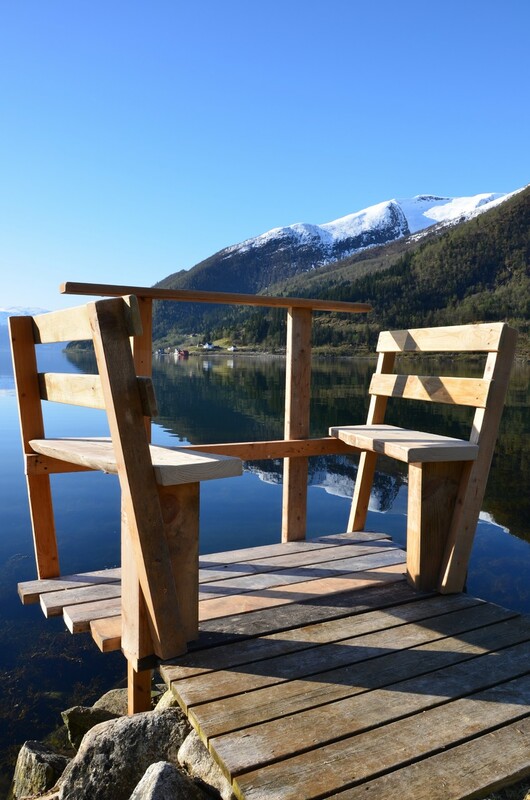 The project holiday home "Villa Sognefjord" starts on the 27th December to the fullest. New electrics, new carpeting and furniture are on the way. The family is going to help us in March and comes to work on the little details. So not a lot is hindering you from having a nice holiday in Norway in our holiday home "Villa Sognefjord" from Easter next year. We'll keep you up to date and will upload the first pictures from the inside in January. We are very excited and looking forward to your visit. All in all a thrilling time ahead! PS: The first booking is already there!